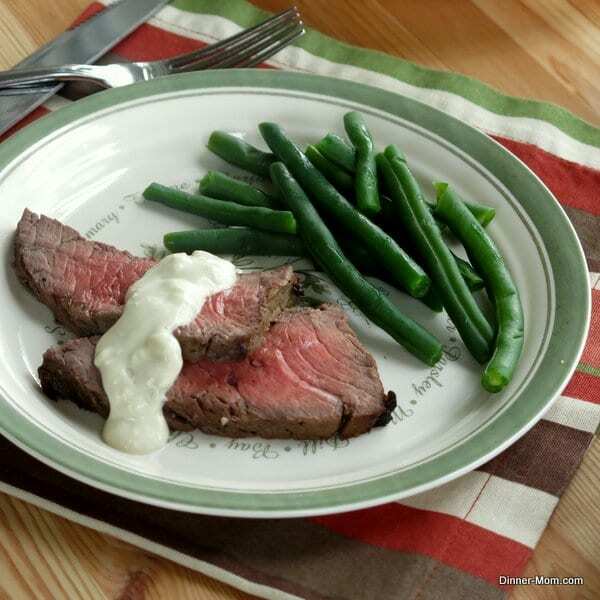 You’re going to want to put this easy blue cheese sauce on London Broil, steaks, burgers and everything else in sight! 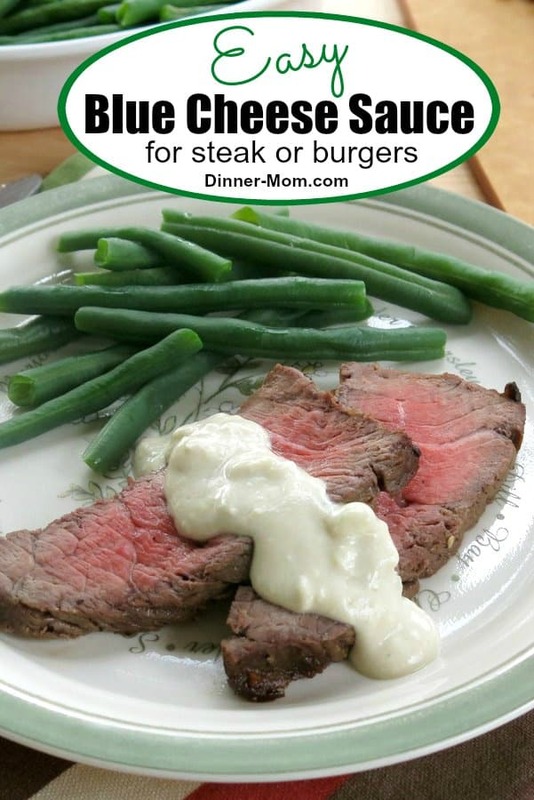 The easy, creamy blue cheese sauce is like the ” icing.” Top steak made with the Best London Broil Marinade with this sauce and it’s sure to be a winner. It’s outstanding on burgers too. Confession time! I actually dislike crumbled blue cheese…by itself. But, I looove this blue cheese sauce on beef and green beans. If there is any sauce leftover, I freeze it in small-sized portions. Then, I pull it out and warm it up whenever a dish needs a little pizzazz. Use full-fat, low-fat, fat-free or any combination in between. Greek yogurt can be substituted for sour cream if that something you are used to doing. We typically use full-fat ingredients in this recipe and I don’t feel the least bit guilty about this creamy sauce because a little goes a long way. I found this gem at Allrecipes a long time ago! Have another idea for this tasty sauce? Add it to the list in the comments below. Please rate this recipe and tag @DinnerMom or @DinnerMom on social media. We love to see what you are cooking up. 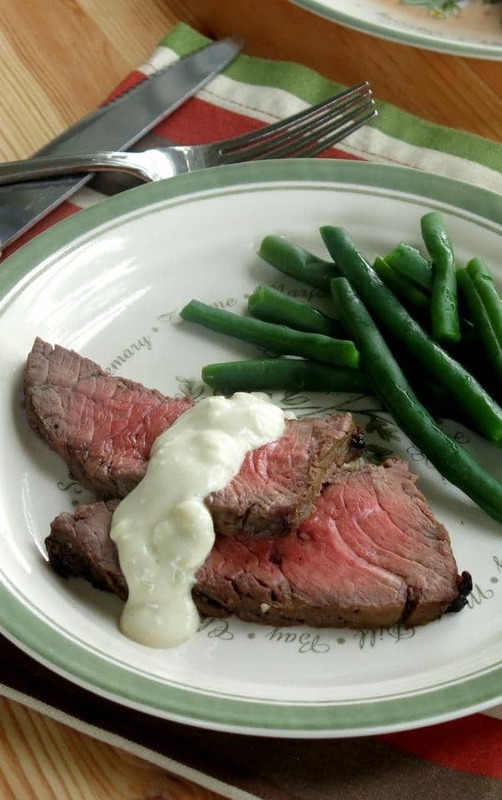 Serve this easy blue cheese sauce over London Broil, steak or burgers. It's great on vegetables too! 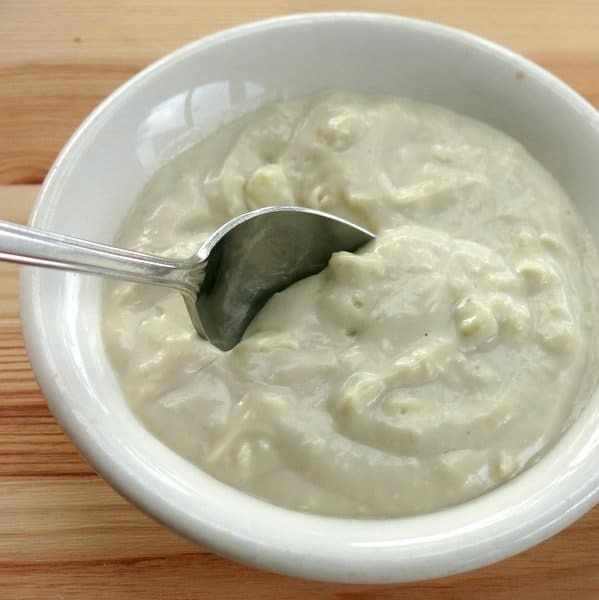 Combine mayonnaise, sour cream and Worcestershire sauce in a small saucepan. Heat sauce over medium-low heat for several minutes to warm. If you have any blue cheese sauce leftover, you can freeze that too. For best results, consume within 2 months of freezing. You take great pictures. That food looks great. What kind of camera do you use? Hi! Thanks and thanks for stopping by. I use Canon PowerShot G15. 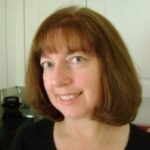 I talk about it a bit over on the Blog Resources Page. This sauce IS amazing. We loved it so much we made it again the next day and used it on burgers.